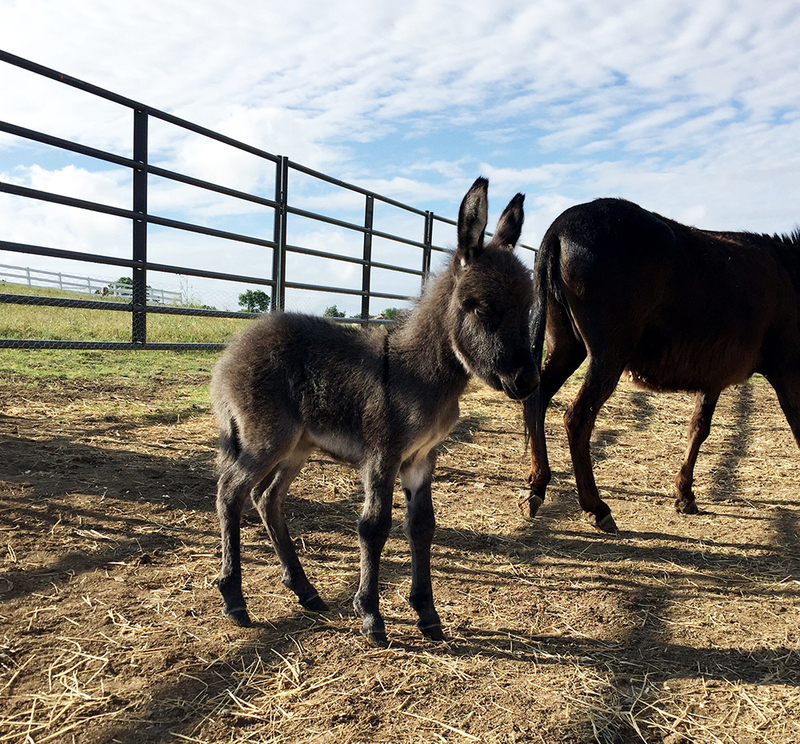 A few months ago we launched "Operation Salt & Pepper" to save two miniature donkeys, and we had no idea that we would actually save three! One of the orphans, who we named Salt, was in critical condition - just skin and bones - and over the first 14 days at the ranch she slowly picked up weight with the help of medicine and tons of good food. 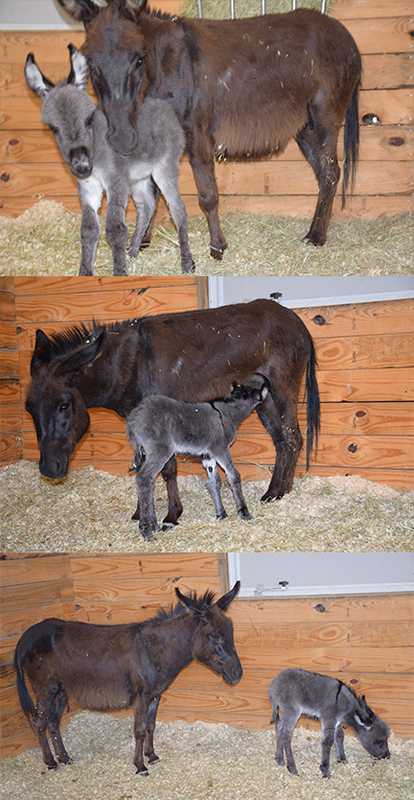 But our second orphan, Pepper (the dark brown miniature donkey featured in the photos to the left), nearly doubled her belly size! As we stood one morning and snapped a photo, we realized that Pepper was suddenly as wide as she was tall, and we just knew -- we're going to have a baby! Woohoo! We started an official "Udder Watch"... a twice daily up-close-and-personal texted photo to our FHF family documenting the progress of Pepper's udder (it's one of the best ways to pinpoint the day and time of a donkey birth and also one of the most embarrassing photos to receive while in line at a restaurant). A few hours before the baby donkey was born, we started checking in on Pepper every 30 minutes. We were SURE that the baby was hours away because of the milk that was dripping (check out the last photo we took before the birth). At around 3 a.m. we paused our check-ins, because a massive storm blew in. 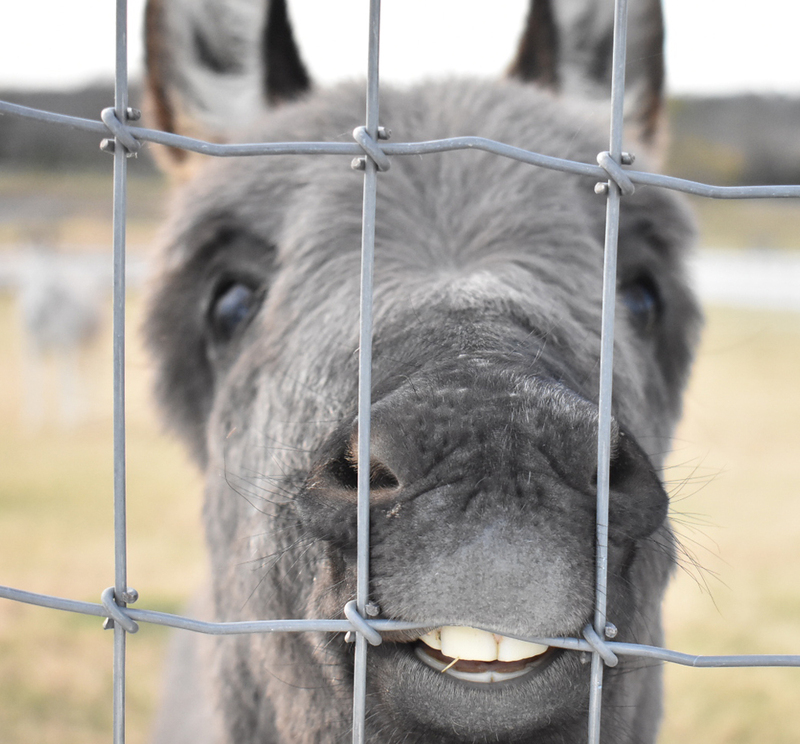 All the animals took cover in their stalls, and when we came out shortly thereafter, we saw two sets of ears coming from Pepper's stall and an absolutely adorable full-furred baby already hopping around and tripping on buckets. Welcome Arlo to the FarmHouse Fresh Ranch! We are over the MOON that we were able to save his mom (she is such a loving and patient soul), and that we also received Arlo as this extra special little gift. He is a bundle of energy. 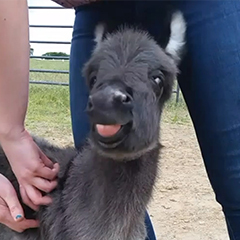 His first back scratch was caught on camera -- he loved every inch of it! And you'll love seeing him from morning to night in our video time lapse that shows just how exhausting a day in the life of Arlo can be!